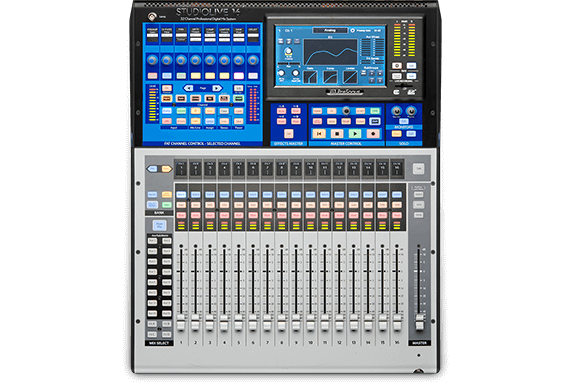 The StudioLive® 16 digital console/recorder is by far the most powerful mixer in its class. This third-generation StudioLive mixer is fully recallable, with 17 touch-sensitive, motorized faders and 17 recallable XMAX preamps. Yet despite its extensive features, the StudioLive 16 actually improves upon PreSonus®’ legendary ease of use while letting you customize its workflow and operations. The StudioLive sound is better than ever, including all-new Fat Channel processing, re-engineered from the ground up, and vintage-style EQs and compressors. Add built-in AVB networking, onboard multitrack Capture™ recording to SD Card, and a complete suite of software, and you have a mixing and recording powerhouse that’s equally formidable in live and studio applications.